April 17, 2014 – marks the exact fifty year anniversary of the Ford Mustang, and the pony car’s birthday celebrations are happening all around the world. 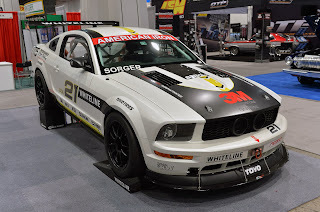 Ford unveiled the 2015 Mustang 50 Year Limited Edition at the New York Auto Show, the official anniversary events are happening simultaneously in Charlotte and Las Vegas, and enthusiasts are gathering for their own celebrations all across the globe. To commemorate the occasion Ford has also uploaded a new video showing just how the Mustang has evolved over the past fifty years. The clip demonstrates the design changes from 1965 to 1967, 1969, 2005, 2013 and 2015. This entry was written by by Anna Nova (Ford Mustang) and posted here on Saturday, May 3rd, 2014 at 4:47 am and is filed under Reviews, Videos. This article was not written by us, rather gathered using RSS feeds listed here. We take no credit for this article. You can leave a response, or trackback from your own site.